Another Sepia Saturday and again it drums up ideas of something major and again tragic. Next week I'm planning to write about something more humorous and lighthearted! I was not born when Kennedy was shot so decided to write about something a bit different. 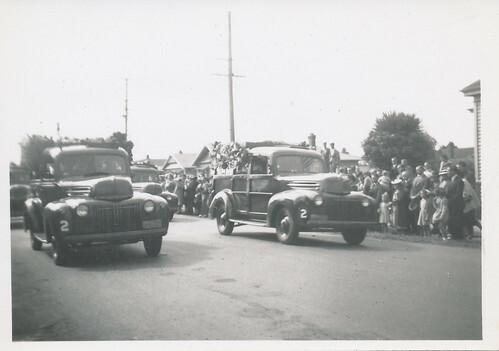 On 18 November 1947 my Grandma went to work as usual at Beaths Department store in Christchurch, New Zealand. She was 19 years old, a dressmaker in a large department store. She would bike to work every day, about 6 kilometres into town, with her friends. They would all go together. They parked their bikes up and went into work. At about 3.30 pm there was a smoke smell coming from a basement in Ballantynes department store, across the road from where my Grandma worked. A while later that afternoon my Grandma's boss came informed all his staff about the fire which had now got very big, and they were sent home early. She said everyone was crying. Most of them had friends working in Ballantynes and they were all so upset. Grandma worked on the opposite side of Beaths from the fire. She was sent around the block a different way in order to get her bike to go home. She never saw the fire close up, thank goodness, just the smoke rising from behind buildings. 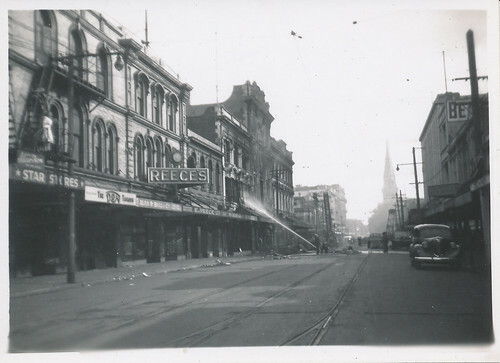 The fire was so terribly hot that it blew out windows in Beaths department store which was on the other side of Colombo Street (the main street of Christchurch). Meanwhile in Ballantynes Department store there was chaos. My Auntie Hazel was in the hairdressing department and her boss had the presence of mind to march the staff single file out of the building in a calm and orderly manner. Many other departments however didn't do this thinking there was no problem, especially the second floor staff. My Grandma remembers that people tried to get out of some doors but they were locked. It doesn't bear thinking about, but she said that many people died piled against the locked doors. I have read other accounts online and there is no mention of this, only that they were at the upper windows trying to get out. Three women jumped from the third floor windows. Two survived but one named Violet Cody died of her injuries. Their workmates who didn't jump all died of smoke inhalation. Violet was the only body to be identified. All others were unidentifiable. My Grandma lost two friends that day, her friend Nellie who she went to primary school with and was in her knitting club during wartime (Nellie Elenora Marie Christensen), and a girl she went to Sunday School with. For a full list of those who died, click here. For more indepth information on the worst fire ever in New Zealand click here. To see a video of the fire click here. We have a photo of the fire being put out but have no idea who took it. Probably a friend of my great Grandfather. You can see the hazy spire of our old Christchurch Cathedral in the distance. You can just see the start of the Beaths sign visible on the right hand side of the photo. There had been a terrible lack of urgency to get out of the building and the fire brigade was understaffed, undertrained, and had bad leadership. The staff didn't understand the severity of the fire until it was too late and their escape routes had been blocked. Also the Ballantynes building was made of flammable materials and was badly designed so that some areas had no escape routes. 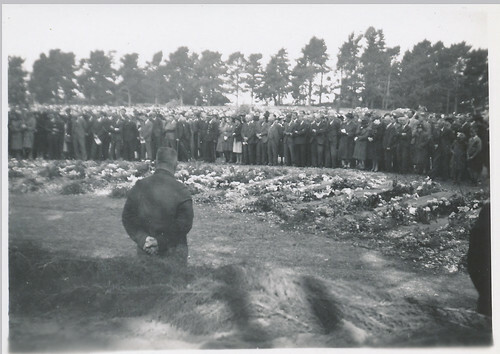 There was a huge civic funeral for the 41 people who died that day, held on 23 November 1947 at Christchurch Anglican Cathedral - the largest ever in Christchurch. The procession went from the Cathedral to the Cemetery, a distance of three miles but apparently was very long and went for a long time. 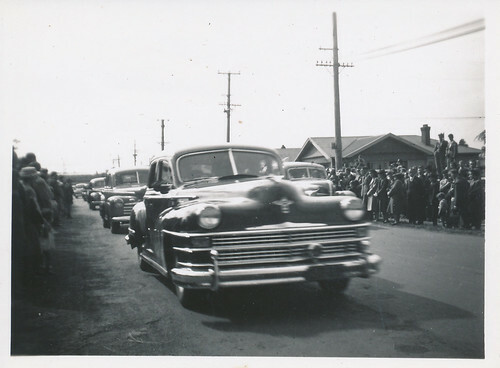 My Grandma told me that my great grandfather Arthur Cyril Pearce was driving dignitaries in either a Chrysler or a Plymouth in the procession. He worked for the Public Service Garage. I think it was actually a Chrysler he was driving as a friend took photos mainly of a Chrysler driving through the crowds. He also captured pictures of the trucks mounded with flowers which contained the bodies of the victims. The procession ended at the Ruru Lawn Cemetery, Christchurch and the following photo shows some of the 41 coffins laid out with flowers. I'm not sure who the man is in the middle of the photo. Apparently 800 friends and family attended the funeral. Our family doesn't know who took these photos, but it was an friend of my great grandfather. I'm not sure what this person's relationship was to the people who died and I will probably never know unless someone messages me that their grandfather took the photos! Ballantynes Department store is still open today despite the fire and the Christchurch earthquakes. It was one of the first stores to reopen in the central city after the earthquakes and from what I can see when visiting - it's busy and thriving. I wrote this post on the 66th anniversary of the tragedy (unknowingly and this freaked me out) and Sepia Saturday is the 66th anniversary of the funeral (23 November), but the Christmas shoppers are out in force and the tragedy is only a distant memory now. The saddest part of so many stories of people dying in fires is reports of bad construction, poor decisions and delayed response. Friends and neighbors must be haunted by thoughts of how the story could have ended differently - at least better, maybe not a totally happy ending. Your story, your photos, and the timing of the anniversary make this an A+ contribution to Sepia Saturday. Faulty or no communication at all between departments and floors probably led to such a high death toll. Lack of escape routes in case of such a disaster also added to the loss of life. So sad and so unnecessary. Hopefully, since the store is still functioning, the powers that be have rectified those problems! A beautiful tribute to those who lost their lives in such a terrible fire. To have the personal testimonies and photographs of of your grandparents makes it more poignant still. I can only echo Wendy's final sentence in her comment - a top notch post for this week. .. . Thanks for your lovely comments! Much appreciated! That was a sad story. They should have been all able to get out. It made me wonder how I would get out of a big store if there were a fire. It's sad stories like this which makes you so thankful for your own life. Poor Christchurch. Such a tragedy but a well written story. Thanks. An excellent blog, thank you. That mass funeral must have been memorable. I think my mother knew someone who died in the Ballantynes fire. The store may be thriving, but it's still operating out of temporary premises, isn't it? How eerie is your timing?! What a huge loss of life, tragic. Bel, what a tragic story. Sometimes it takes a terrible story like this to change safety standards and make the rest of us safer. Of course, that does not help those who died that day. Thank you for sharing your family story. So very tragic, and pieced together perfectly for this week. Exceptional photos as well, many very telling of what turmoil and sadness lurked. This was an excellent story. What makes tragic events like this so difficult to accept is the intense feeling that they did not need to happen. Accidents with careless or thoughtless actions are very disturbing and remain long in personal and collective memory. Several years ago I read a book about the horrific Hartford Connecticut Circus Fire of 1942 when 169 people perished in a terrible fire. The cause was the flammable waterproofing applied to the circus tent. I had checked the book out from the library and when I took it back to renew the librarian at the desk exclaimed that she had nearly been there! As a young girl, her family was going to take her to the circus that day, but she was ill and they did not go. Such little moments of grace can balance such horrible events. Mike, what an amazing story the librarian told you. Her family was very lucky not to go through that fire. We've had a lot of those kinds of stories after earthquakes in our city. People who were in the right part of the building at the right time and when it collapsed they rode the building down to the pavement and just stepped out on the footpath with a few bruises. So lucky. Others weren't so lucky. It's tragic how so many incidents result in loss of life due to a number of different things happening at the same time. At one time I had the responsibility for reading all the incident inquiry reports, especially the lessons learned and building on the scenarios for auditor training courses which involved personnel from fire & rescue services. Christchurch has had more than its fair share of disasters; your story is yet another one of those. What an interesting story!! I think most towns and cities have similar tales when society didn't think of the repercussions of lax rules and safety training. Such a sad story. And your family stories and pictures make it all the more personal to read. Perfect for the prompt. And we will all enjoy something more lighthearted next week!